Bubble, the new online destination for curated, innovative health & wellness products is live. Bubble features the best-tasting, highest-integrity health foods designed for a variety of foodie needs and lifestyles, including Keto, Paleo, Vegan, and Gut health. With new seed funding from supermodel and entrepreneur, Karlie Kloss, NBA star, Miles Plumlee, and OpenNest’s investor Tyler Wakstein, Bubble plans to introduce more independent food brands to its marketplace and launch its own branded products, including their first release of Hella, a new, better-for-you cocoa hazelnut spread. “I’ve always been passionate about discovering food options and ingredients that are both delicious and good for you," Kloss said. 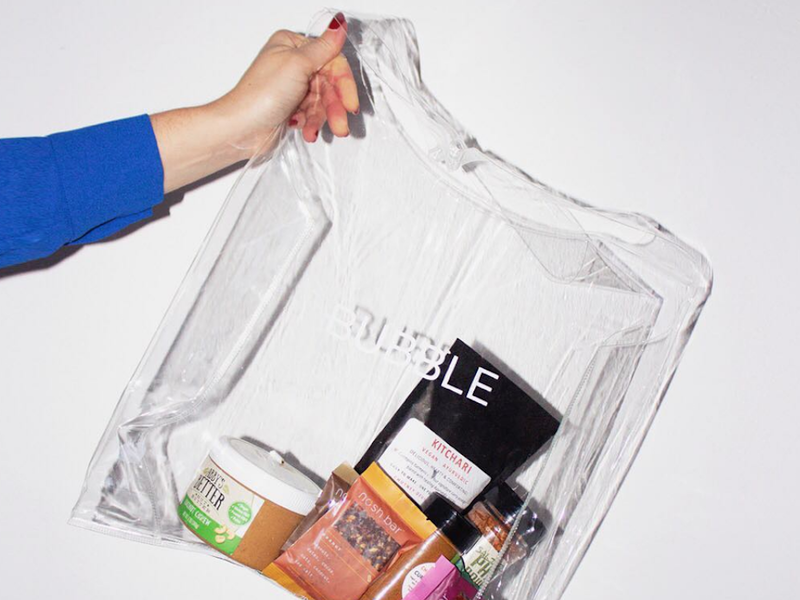 "Bubble is creating a community that offers tasty, nutritious products in a smart, easy-to-search way. I'm excited to support Bubble’s female-led team as they launch the marketplace." Supermodel Amber Valletta showcases key looks from Agnona’s Spring/Summer 2019 collection, lensed by Ezra Petronio. Designer Simon Holloway dedicated the collection to artist American Joan Jonas, 82, previously honored in an exhibition at London’s Tate Modern. In this film, we see Jonas at work in New York. Key items in Agnona’s spring 2019 collection were made in vicuña, one of two wild South American camelids living in the high alpine areas of the Andes. Vicuña, along with the guanaco, is a relative of the llama. It’s believed to be the wild ancestor of domesticated alpacas, and it remains wild today. Nearly hunted to extinction in the late 1980’s, the vicuña herds made a slow, steady comeback and are expanding today in the wild. Driven largely by their father’s adoration of the wool product, Sergio and Pier Luigi Loro Piana, the co-CEOs of Loro Piana, the Italian mill that was a part of the mid-century ‘Made in Italy’ movement and would eventually grow into one of the world’s largest producers of cashmere — and its biggest supplier of vicuña. The fibers are collected using the chacu method of the Incas—a half-religious ceremony where the local community forms a human chain around the animals, slowly closing the circumference of their circle for shearing. An adult vicuna produces only about a pound of fiber a year, producing a cloth so fine it was considered to be cloth of gold, writes BofF. Adut Akech Says Even As Richest Model In The World: "I Will Still Be A Refugee. I Am A Refugee." AOC doesn’t care about Adut’s favorite makeup tips. Backstage snaps of Adut at a runway show are not our motivating life force. Her family life and history as a South Sudan refugee in Adelaide, Australia do get our attention, and Adut’s Vogue Australia December cover editorial adds rich soil to her personal global story. Top model/talent Kate Upton and baseball star Justin Verlander have enjoyed a whirlwind first year of marriage, culminating in the birth of daughter Genevieve on Nov. 7. Estée Lauder’s new face, Florida-raised Grace Elizabeth (Cabe) celebrates the holidays in the brand’s ‘Beautiful Belle’ fragrance shoot and Lauder’s ‘Pure Color Desire Rouge Excess’ creme lipstick. W Magazine profiled Grace Elizabeth in September, in advance of another walk on the Victoria’s Secret runway, now in countdown mode. The brand may be struggling with multiple challenges, but in the world of models — these girls love Victoria’s Secret. Read more after Grace Elizabeth’s Estée Lauder beauty images. She takes being a face of Estée Lauder and Victoria’s Secret Pink very seriously. We share a quick look at Grace Elizabeth’s recent 2017/2018 editorial and brand work. See more of her work in Grace Elizabeth’s AOC Model Archives. Today’s brides have a passion for naked cakes and Momofuku Milk Bar is leading the trend, offering patisseries for wedding days! The Milk Bar made big news recently, supplying the wedding cake for Karlie Kloss and Joshua Kushner’s quiet, surprise nuptials last week for 80 guests in upstate New York. The couple will hold a much larger reception in the spring. The Milk Bar wedding cake is no surprise for Karlie because she has worked closely with the brand in the past and is good friends with the bakery's owner Christina Tosi. In 2012, with help from Tosi, Kloss created her very own Milk Bar cookie called Karlie's Perfect 10 Kookie. At the time, all the proceeds earned from the treats benefited FEED Project. The newlywed's special creation is still available at Milk Bar. In a late September 2018 interview on Eater, Christina Tosi shares her strategies for fundraising and growth.